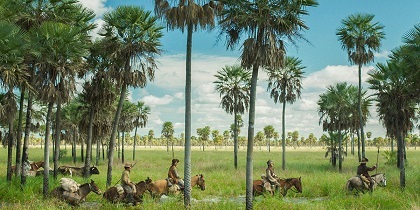 Director: Lucrecia Martel. Cast: Daniel Giménez Cacho, Juan Minujín, Matheus Nachtergaele, Lola Dueñas, Rafael Spregelburd, Daniel Veronese, Nahuel Cano. Screenplay: Lucrecia Martel (based on the novel by Antonio Di Benedetto). Twitter Capsule: Mad midlevel bureaucrat as origin, emblem, and absurd object of vertiginous colonial nightmare. Formal mastery off the charts. Second Capsule: Re-upping on second encounter with this mystifying, exhilarating rune, a buzzing termite-farm of envies, lusts, resentments, and dementias.